On view at the Morgan Library & Museum through September 23, 2018. To look at an artwork in person yields a richer, unmediated, and somehow more authentic experience than seeing it projected onto a screen, printed in a book, or illuminated on a smart phone. This idea may seem a truism, but I found it particularly apropos for taking in the drawings of Wayne Thiebaud now on view at the Morgan Library & Museum. 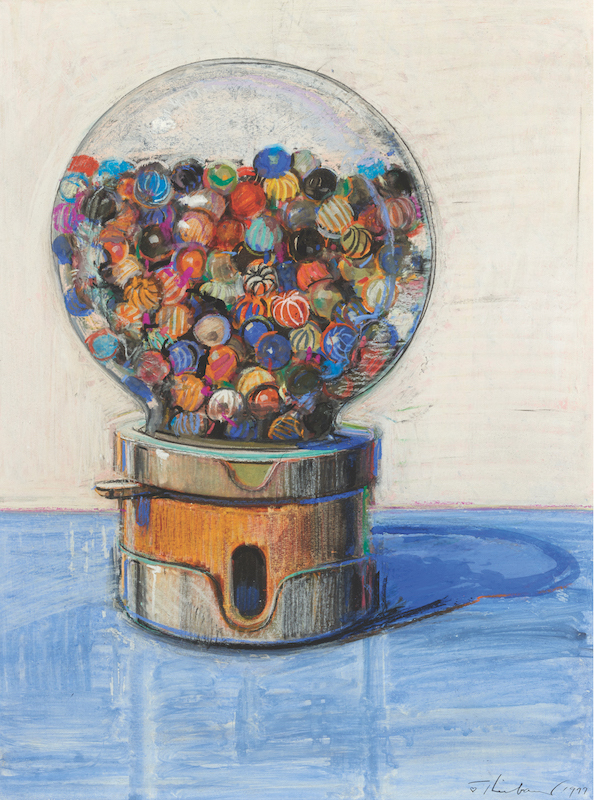 Wayne Thiebaud, Draftsman is the first comprehensive museum show focusing on the drawings of an artist best known for his colorful paintings of cakes, slices of pie, and ice cream cones. The lively and insightful wall texts incorporate Thiebaud’s insights and commentary about the work on display. This exhibition is full of surprises. 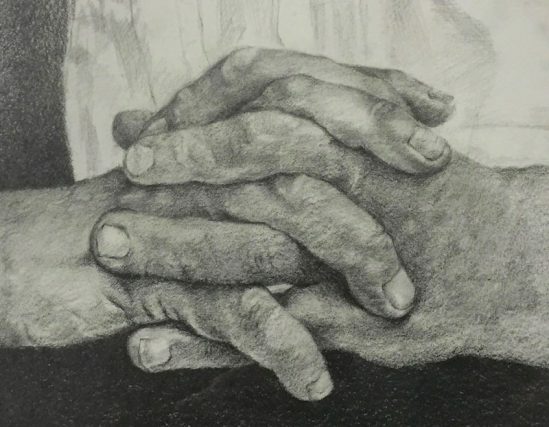 There are examples of the artist’s cartoons, still lifes, portraits, figure studies, cityscapes, landscapes, exploratory sketches, preparatory studies, and finished works of art. Thiebaud used a variety of media: charcoal, graphite, ballpoint, ink, pastel, colored pencil, watercolor, gouache and oil in a multitude of diverse combinations applied with pencil, pen, and brush on surfaces such as Strathmore Bristol 500, Strathmore Either Side, and Illustration Board. The works are hung in a rough chronology with curators choosing to group them according to his diverse styles throughout his long career. Many pieces on view have multiple dates, revealing the artist’s habit of revisiting a work, sometimes years later. Leonardo da Vinci also worked endlessly on his drawings and paintings returning time and again to improve Mona Lisa until his death. 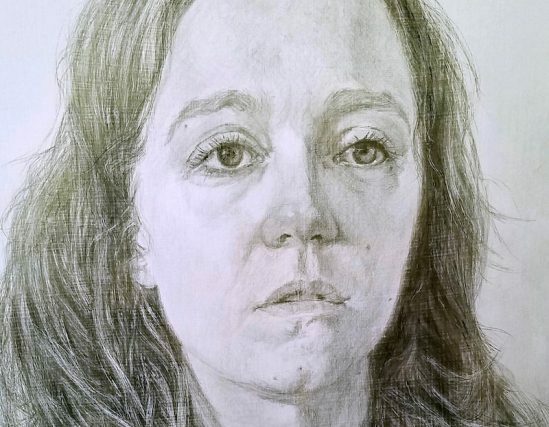 How often have you stopped working on a drawing or painting in despair? Or stopped thinking it is perfect? Try putting an image away for a while, and then returning to it with a fresh eye, added knowledge, and new technical skills. It is a time-proven and profitable process. Thiebaud returned to the same subject toying with what art historian Lizzie Boubli terms “progressive variants” of values, colors, and compositions. Candy Sticks and Peppermint Sticks, both of 1964, and Page of Sketches with Candy Sticks, done during the 1960s, are displayed together and demonstrate alternative possibilities. Moving out of one’s comfort zone, as Thiebaud did, away from the stagnating use of the same medium in the same way, is a creative challenge that can foster fresh ideas. To understand more about Thiebaud’s ideas, take photos of his color studies, convert them into black and white values, then view the originals again to discover how his use of relative values are at play in his color choices. Pausing to look closely, attentively, and perhaps even to stare a bit, at almost any of Thiebaud’s color still-life objects or figure images, his use of some surprising optical illusions becomes apparent. At first, objects seem obviously defined, simple, pleasant, pretty, quite familiar, and realistic. Then, they melt. Thiebaud’s inventive use of the visual and photographic halation is at work. Bright areas appear slightly blurry. His subtle use of hard- and soft-edged lines in repeated unmixed complementary colors isolate individual forms, making three-dimensional objects shimmer on their radiant white backgrounds. Colors and darks surrounded with white appear darker and more intense. The even surfaces of negative areas contrast with the heavy impasto of the positive, pushing them forward, off the picture plane. The varying widths and sharpness of edges makes shapes shift in space to create a dynamic tension. Lively light seems to emanate from the objects themselves. It is the result of Thiebaud’s application of Hans Hofmann’s dictum to figuration: “In nature, light creates color; in the picture, color creates light.” The result is magical. 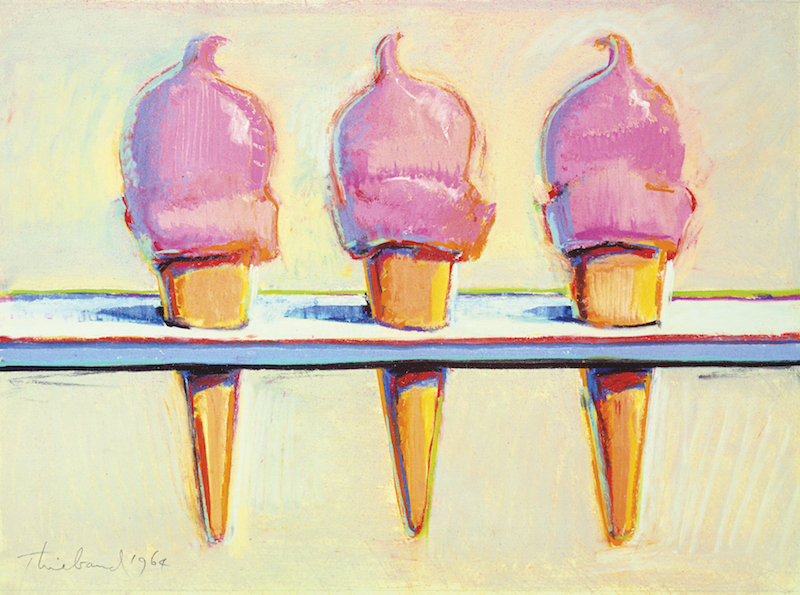 Wayne Thiebaud, Untitled (Three Ice Creams), 1964, pastel and graphite, 9 1/4 x 12 1/4 in. Private collection. 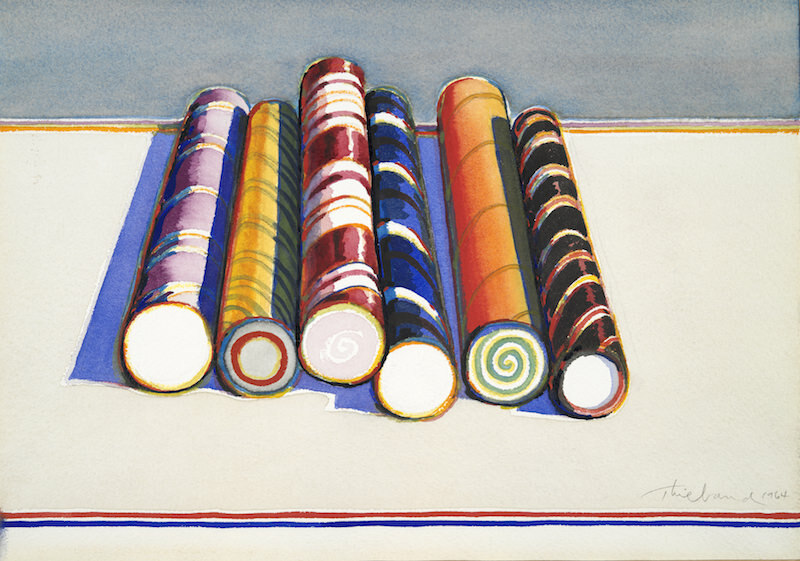 Wayne Thiebaud derived his signature style from many influences. He claims to have never felt “comfortable with that easy categorization of fine and commercial art,” nor does he feel that there is “much of any interest that separates abstract and figurative painting.” The artist’s influences are eclectic. Born in Mesa, Arizona, he moved to Los Angeles and studied at the Frank Wiggins Trade School, where he learned about design, composition, symbolic imagery, graphic conventions, and core techniques of commercial art. Later in New York, as a struggling cartoonist, illustrator, sign painter, designer, commercial artist, and advertising art director, he absorbed the International Style. He picked up its minimal “less is more” aesthetic; the “methodology of reduction”; visual impact; the grid; exaggerated perspective; bird’s-eye views; foreshortening; strong directional compositional guides; focus points; the use of white space; vivid contrasts and primary complementary colors. During a stint working at Universal Studios and serving in the United States Army Air Force, he learned about lighting, photography, and film. Thiebaud went on to study at the Art Students League of New York, taking a sabbatical from a teaching post at UC Davis, acquiring additional techniques and learning about concepts of form, observation, memory, and symbolic representation from a fine art perspective. He adopted Abstract Expressionism’s impulsive line and lush, painterly brush strokes without the movement’s angst; abstraction, without excluding representation, Proto-pop and Pop ideas without their hard-edged, flat, mechanical quality, and concepts of Photorealism without its excessive, exacting, or exaggerated detail. “I slowly began to think about becoming an artist,” he has said of this period. Thiebaud’s interest in depicting commonplace objects appears to have predated that of Pop artists. He explored color theory with his own vision, perspective with his own point of view, and he found his own signature subjects, his own signature style. Wayne Thiebaud’s creative process relied on remembering information from observation and then reconstructing it from imagination. His images are based on abstract simplifications that allow him to depict a subject’s Platonic form. His images emerge as easily recognizable, perfectly-stylized symbols. Though not realistically rendered, his images of things are exactly what we expect them to look like. 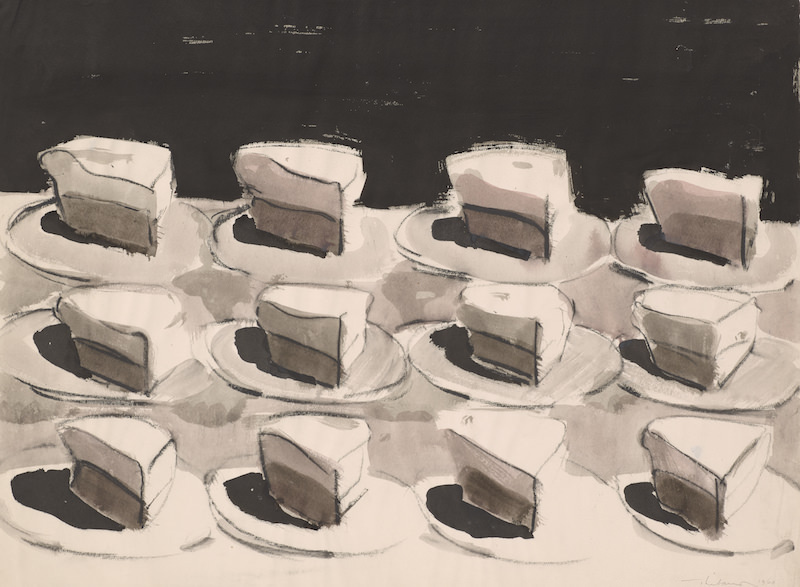 It is impossible for me to resist thinking about Thiebaud’s delectable edibles celebrating America’s postwar abundance in contrast with Chaim Soutine’s images of slaughtered animal flesh that make suggestive references to the Holocaust in a show now on view at the Jewish Museum. Wayne Thiebaud’s pies, cupcakes, and ice cream cones appear as tempting treats tauntingly out of reach, displayed in shop windows and countertops, available to those who strive to afford them. The artist’s figures, done with similar media as his still lifes, seem equally remote, as isolated as the individual pies composed in groups but spaced apart. His figures feel like objects that are simply subject matter for color studies. 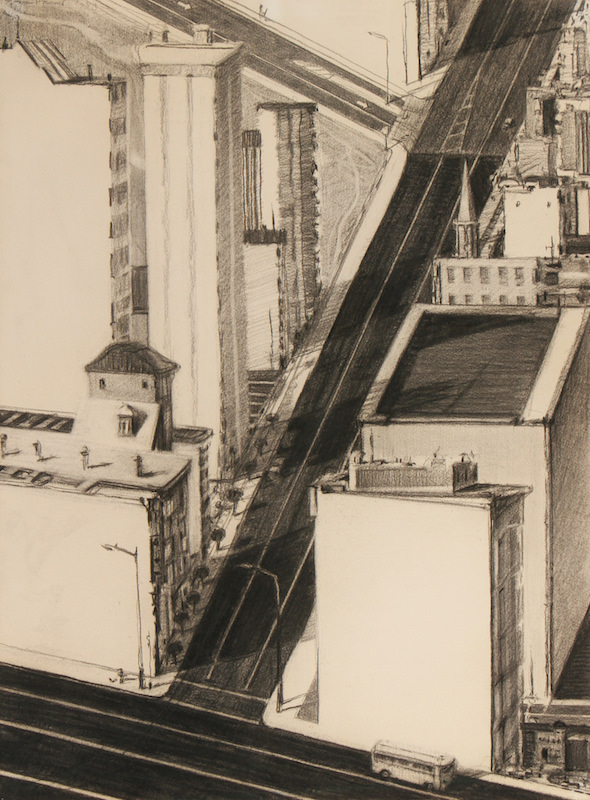 Thiebaud’s striking cityscapes and landscapes bring to mind the art of his fellow Californian artist, Richard Diebenkorn, but Thiebaud’s San Francisco streets are more harshly askew and oddly real. 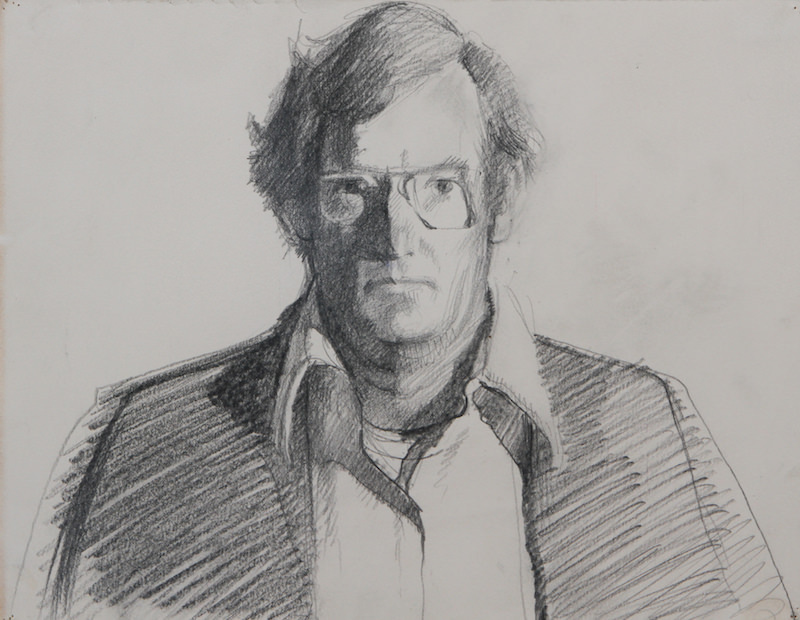 Three Roads (1983) started en plein air and was finished in the artist’s studio where he used easily erasable charcoal to play freely with the perspective of what he actually saw to render a tenuous, tension-provoking effect that produces the vertiginous visual experience. Three Roads is dotted with tiny isolated individuals, so dwarfed by the scale of the buildings, that they are almost invisible. They are going about their business unconnected, unaware of each other. A smudge on the lower left of the image suggests someone walking a dog on the corner under the light post. On a roadway located near the uppermost edge is an artist drawing at an easel but facing away from the pictured scene. Is it a revealing self-portrait? Wayne Thiebaud’s Self Portrait (ca. 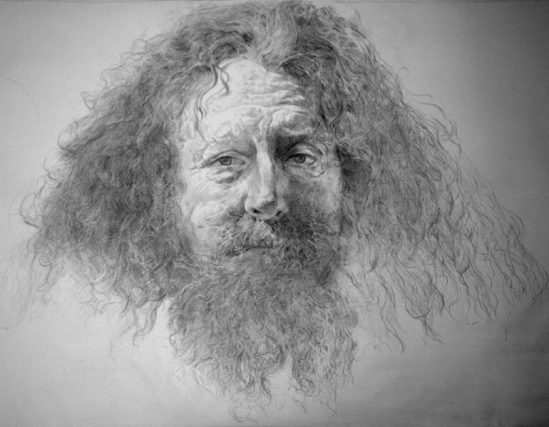 1970), done in graphite, is an elegant example of his skill as a draughtsman in the academic tradition using hatching, cross-hatching, and chiaroscuro to create the illusion of form on a flat picture plane. Contrary to the prevailing concepts of his contemporary educators and artists, Wayne Thiebaud remained steadfast in his belief that a knowledge of art history, anatomy, perspective, composition and technically-precise craft does not stifle creativity but rather frees it. His countless notations, often cropped storyboard-style, demonstrate the value of making “sketches while visiting different countries, walking in museums, listening to concerts.” This is a habit that all artists should develop. As an instructor, he advised students to copy Old Master drawings. Untitled (After Daumier) shows him doing just that. Drawing, he has said, “is a kind of inquiring research tool that painting rests on.” Why not try copying a Thiebaud? Wayne Thiebaud in conversation with Timothy Clark and Gene Cooper at the Art Students League can be viewed on the Art Students League’s YouTube channel.